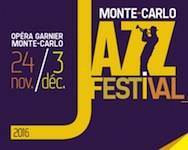 From 24 November to 3 December the Monte Carlo Jazz Festival showcases new talent and legendary musicians, performing on the same stage. Organized by Monte Carlo SBM. For more information and reservations phone +377 98 06 41 59, email ticketoffice[at]sbm.mc and visit the event website at: Monte Carlo Live: Monte Carlo Jazz Festival.